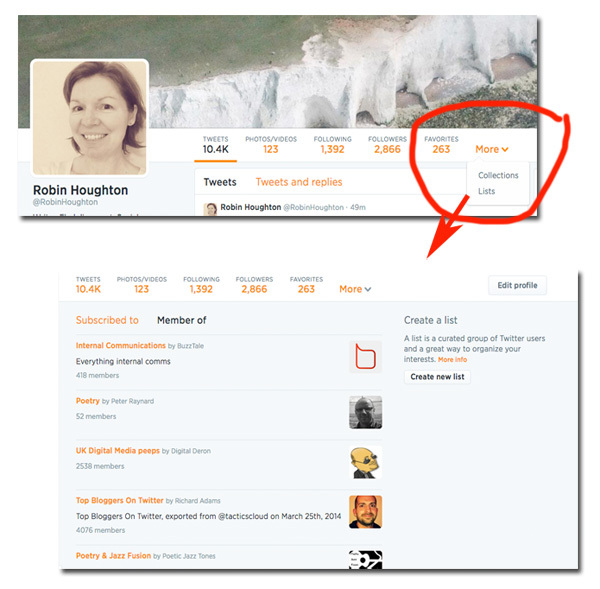 Anyone can create a Twitter List, and Lists can be public or private. They are a way of grouping Twitter users, in any way you wish, for example, ‘Poets’, or ‘Literary Agents’ or ‘Workshop Friends’. Think of a list as a segment the people you follow on Twitter. 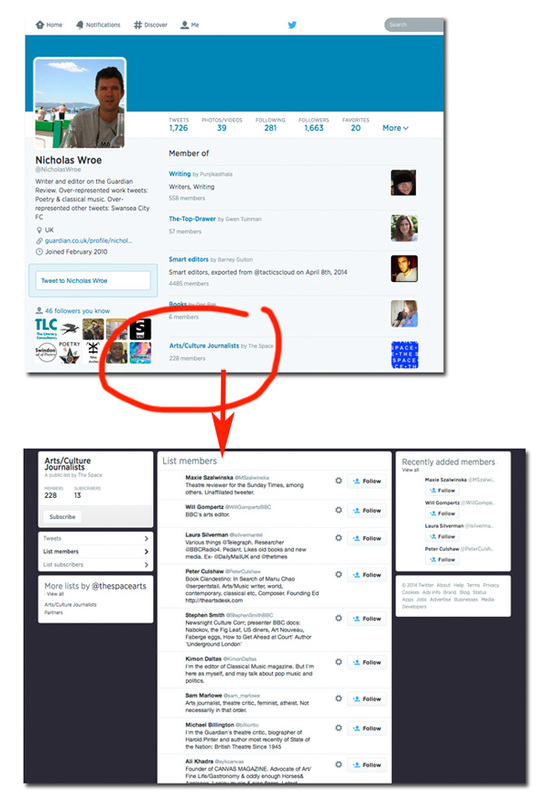 A Public List can be seen and subscribed to by anyone, but Private Lists are not visible or searchable by others. You might create Private Lists for research purposes, or if the subject matter of your list is sensitive (for example, competitor activity). When you add someone to a List, they won’t get a notification, so adding someone to a Private List is a way of following someone without their knowing. This is one reason I recommend new Twitter users to get into the habit of adding people to lists. Let’s say you want to follow Andrew Holgate, Literary Editor of The Times. The point at which you click ‘Follow’ may be your one and only chance to get his attention. If he decides to check you out and finds you haven’t tweeted yet and your profile isn’t complete, he probably won’t follow back. So instead of openly following him, you could add him to a private list of ‘Literary Journalists’ and follow the list. At a later date when your Twitter profile looks more active and you’ve done some interesting tweets, then you can hit the ‘Follow’ button and who knows, you might get a follow back if you’re lucky. As the number of people you follow grows, it gets harder to see everyone’s tweets, especially those outside your time zone. But a List is a much smaller group, which makes it easier to monitor those people’s tweets. Don’t forget you can also follow other people’s lists, which is much quicker than creating your own from scratch, although you’re not in control of who’s on the list and therefore whose tweets you’re exposed to. 1. 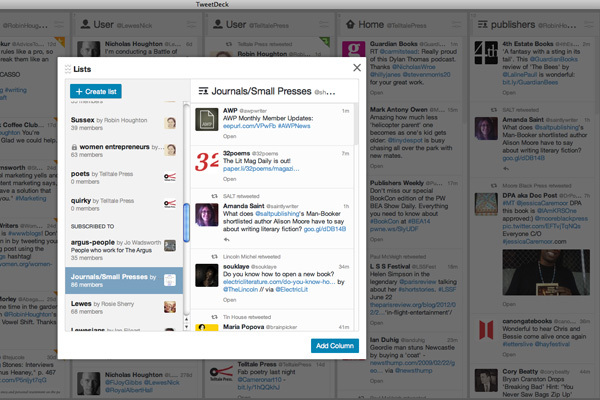 Twitter search box – search by key words, names of publications or individuals. Although you can’t actually search for Lists, if you go to a profile page of a relevant individual, then check out the lists they are on, you can strike gold. For example, I searched for ‘literary editors’ and randomly chose Olivia Cole (@OliviaCole1), Literary editor of GQ & Editor of Spectator Life. Turns out she’s on hundreds of lists, from ‘Editors Worth Following’ , a List curated by Vincent Dignan, to ‘Poets, Writers’ by David-Glen Smith. 2. People you know – always check out the Lists of people you follow as it may throw up all kinds of great Lists already in existence. And if not, you’ll at least find more of the same kinds of people you want to follow and you can start your own List. 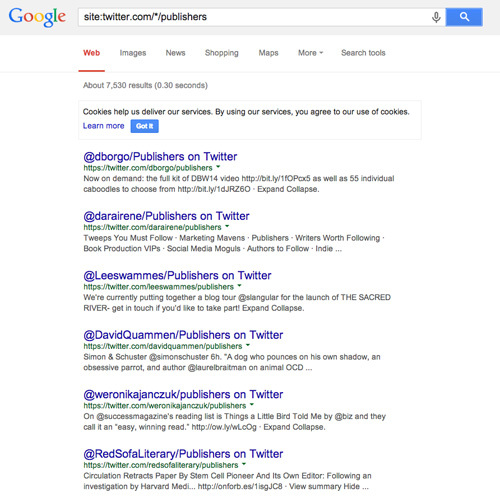 – replace ‘keyword’ with your search term and Google will find you Twitter Lists with that word in the title. * Follow a list of literary magazines and never miss a submissions window or important launch. * Seek out conversations around your writing genre/niche and add key participants (readers, reviewers, writers, enthusiasts) to a List. By following their conversations you’ll get to know their likes, tastes, buying habits, events they go to, etc. You might want to make this a Private List and call it ‘prospects’, for example. * Make a list of journalists, reviewers, books bloggers and other ‘influencers’ to find out what they are working on and see any relevant calls for contributors, expert quotes or interviews. Again, this could be either Public or Private, it’s up to you.